Linda runs programs for people with Multiple Sclerosis for the NYC Chapter of the National Multiple Sclerosis Society and for the Staten Island Multiple Sclerosis Group, Inc. In 2003, she received an award from the NYC Chapter of the MS Society for the unusual and varied programs she presented as facilitator for the Staten Island MS Adult Day Program. In 2012, in conjunction with the Staten Island Multiple Sclerosis Group, Inc. they received a grant from the Christopher Reeves Foundation for Whistle OutLoud. 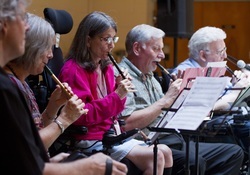 In this program, Linda taught people with MS to play the tin whistle to improve eye/hand co-ordination, stimulate cognitive function and improve group social skills as well as encouraging them to play with other musicians in the community. She currently participates in a drumming program for residents in a long-term care facility. Working with a Latin percussionist in this weekly program, residents play different percussion pieces in preparation for a concert at the local library. Drumming helps break down social barriers and promotes freedom of expression. Residents leave the program with a greater sense of self-esteem. 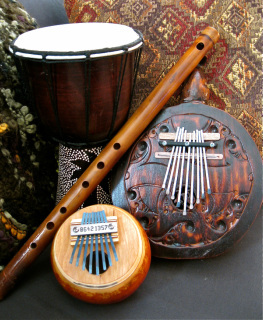 In addition to playing flute for drumming programs, Linda performs for bed-ridden residents in long-term care facilities. These performances help prevent isolation and she was pleased at the response from previously unresponsive residents. She also works with many other musicians to bring entertainment programs to healthcare facilities and her CD “Awakening” is being used to promote relaxation and ease pain in people with chronic illness.